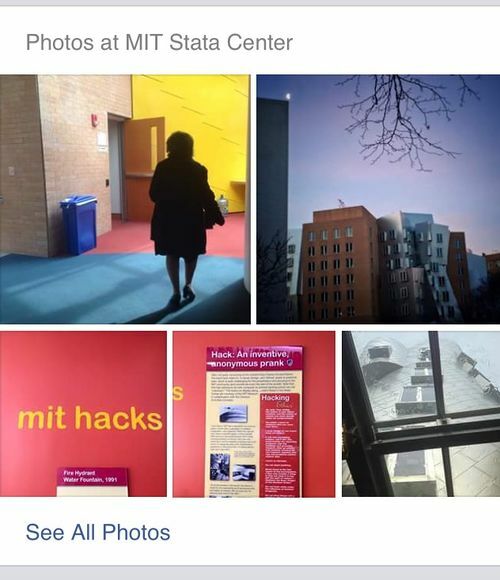 See rsvp for how to and examples of individual rsvp posts themselves! By displaying the RSVPs to your event posts, you show who is likely to participate with your event. It also shows immediate feedback to those that have RSVPd to your event with their own indie rsvp response. There are many methods for displaying the RSVPs for an event. Consider linking from specific RSVP items to the permalinks of the respective indie RSVPs to your event. If you are showing silo RSVPs of POSSE copies of your event posts, from silos that lack permalinks for such RSVPs posts / responses, then you may link them to the user RSVPing to your event as a fallback. Since an RSVP indicates the attendance (or not) of a specific person, multiple RSVPs from the same person should only count as one, the most recent (or most recently updated if newer) RSVP being authoritative. If you POSSE an event to a silo, then it is possible that someone posting an indie rsvp of your post will also POSSE their RSVP to that silo, thus resulting your post seemingly seeing two RSVPs from the same one RSVP from that person. Since those RSVPs represent only a single actual individual RSVPing, your post should de-duplicate any such RSVPs of POSSE copies of your events, and show only a single RSVP, no matter what your display design is for RSVPs. When you detect such duplicate RSVPs on silo copies of your events, you should prefer and show only the indie RSVP on your RSVPs display on your event. 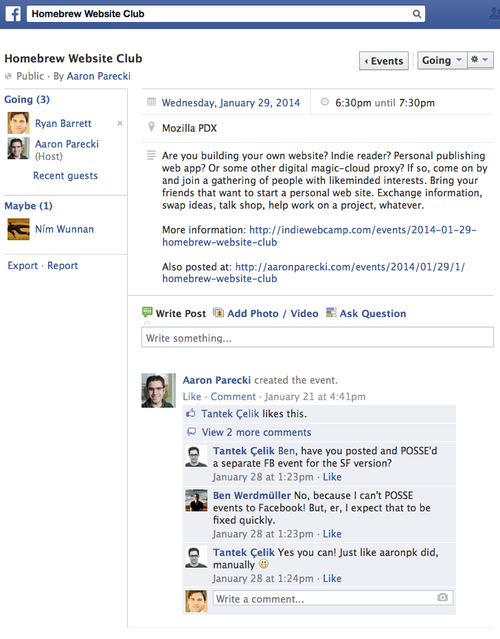 There are a few IndieWeb sites which receive and handle webmentions for RSVP posts and display them in various ways. 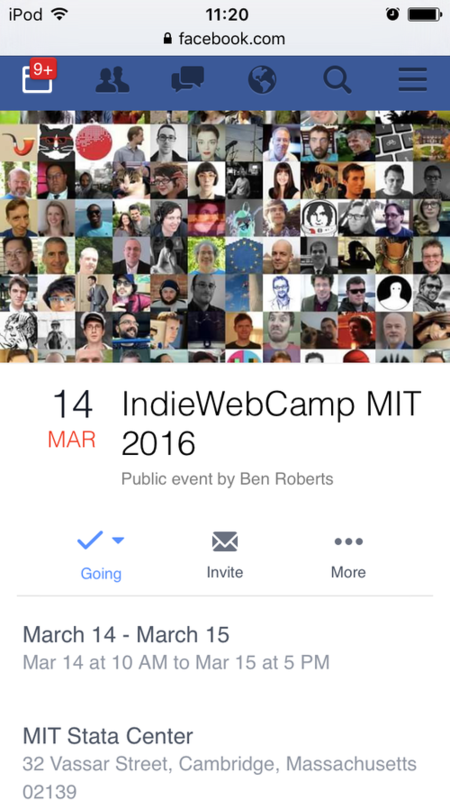 TO DO: Review event#IndieWeb_Examples for dates, permalinks, and more examples of receiving/showing RSVPs on event posts, and incorporate/move those details here to this section, keeping the event examples focused on the event posts themselves. 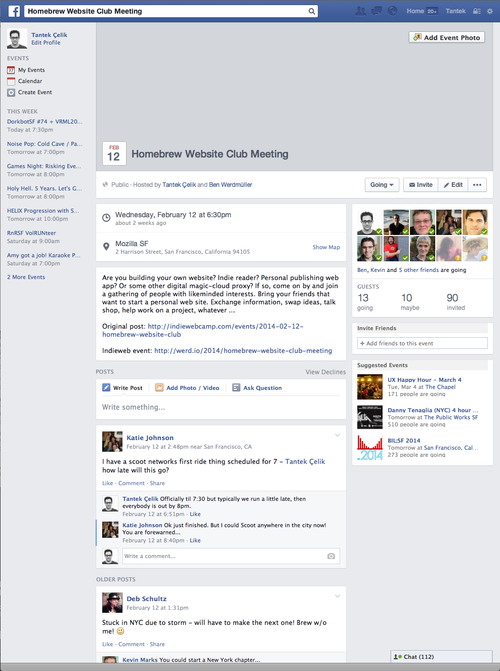 Calum Ryan has been officially accepting and displaying RSVPs for people attending Homebrew Website Club London since 2016-12-14. The implementation is a modification of the Jekyll plugin for handling Webmentions. Upon triggering a build of the static webpage there's a custom filter to change the markup with a visible tick or cross depending on whether a Webmention contains the rsvp-no or rsvp-yes value. In his CMS there's a basic dropdown interface also added for RSVP options that triggers sending a Webmention upon posting short-form content with these RSVP yes/no values included. 3.7 ... add more here! 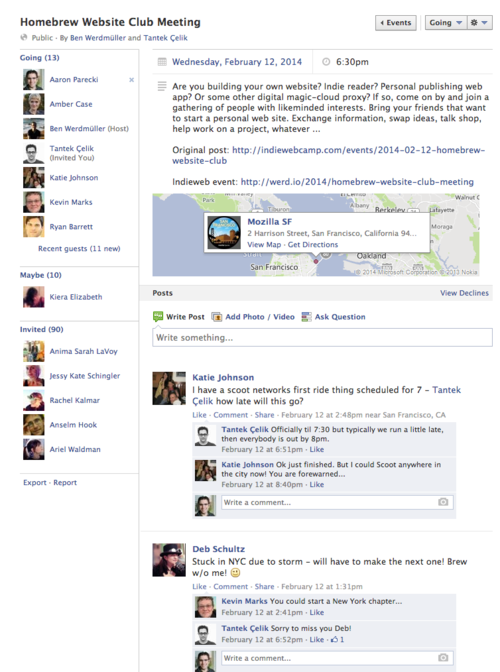 Need to add more from the event page of people receiving/showing RSVPs on event posts. Tantek Çelik has been showing RSVPs facepiles on his event posts since 2017-07-06. 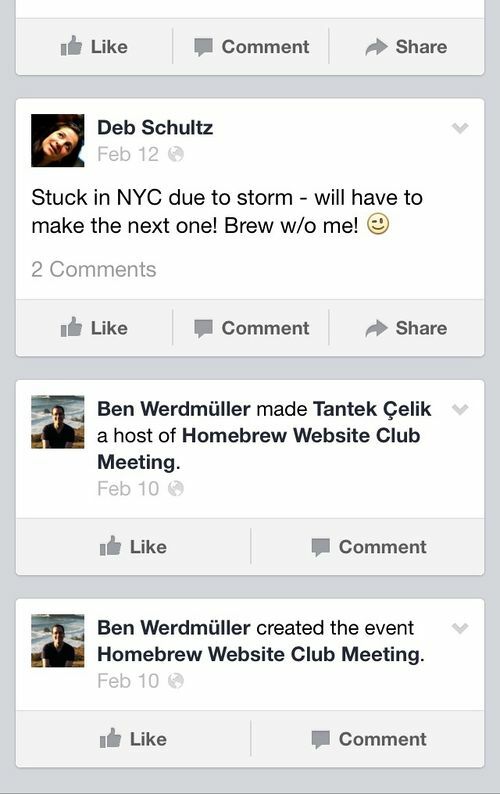 Facebook shows RSVPs on their event posts and has done so many different ways over the years, thus there is a lot of prior art to choose from and be inspired by. Lack of hierarchy (ordering) of going/maybe/invited removes subtle invitee incentive to upgrade from invited to maybe to going. 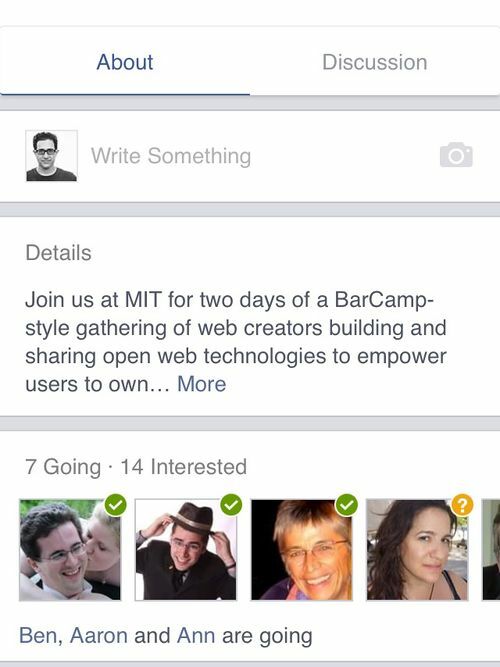 This was perhaps the pinnacle of Facebook's event page design. 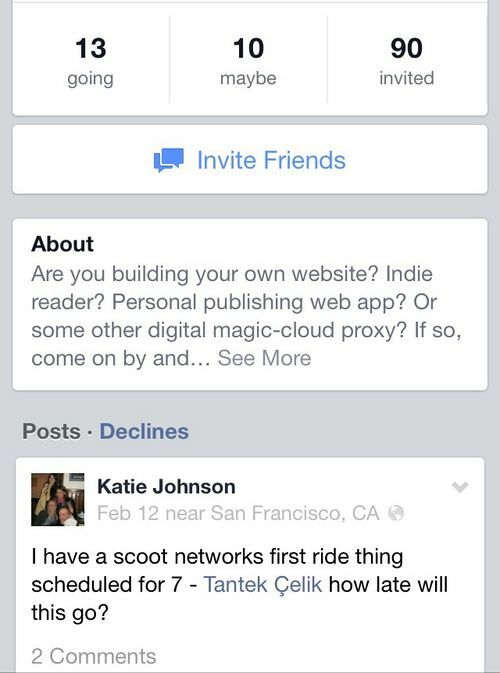 Facebook has had one of the more interesting/nicer/cleaner event page designs for quite some time. 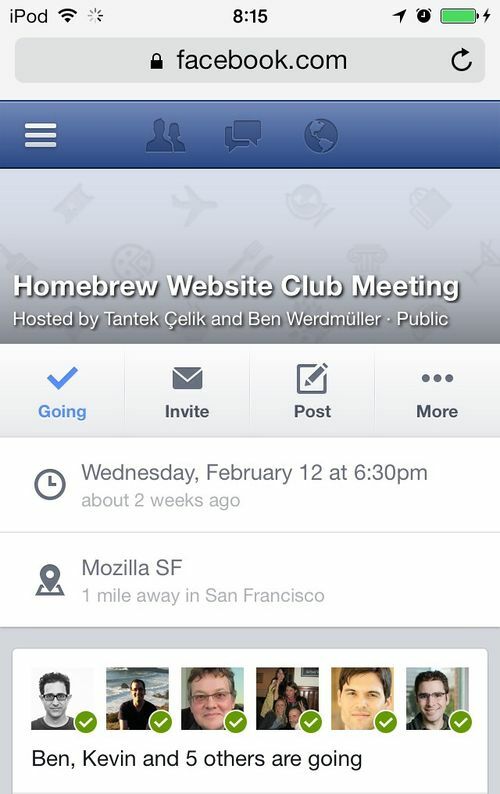 RSVPs displayed on an event page. Clicking on the "Show more" link takes one to a standalone page (pictured below) which allows viewing of both attendees and those who have indicated they're not attending. This page was last edited on 13 August 2018, at 11:40.